Islam embraces women in very high esteem and the Islamic dress code for women is intended to protect and guard the dignity and honor of a Muslim woman. The code of conduct directed by Islamic culture is to promote modest dressing and behavior. Keeping this in mind, Muslim women clothing is designed with utter dignity, modesty and respect. When we talk about Muslim clothing, the first thing we think about is a Hijab. Hijab is the most used word in regard to covering and is commonly known as a headscarf. The purpose of a hijab is to cover the head and chest of a woman. Initially in Islam, but now hijab’s popularity is widespread in western countries too. Women from all religion love to wear a hijab, which comes in different shades and colors to match the outfit of a woman. Jilbab is a long, loose-fit garment, especially designed for the modern Muslim woman on the go. This long length dress covers the entire body of a woman, except for hands and face. A Muslim woman usually wears a hijab with it to cover their head and neck. With the evolution in time, several alterations have been made in jilbabs to make them modishly modest for the modern women. Niqab is another Muslim garment for women. It is a combination of a head covering and scarf that covers all of a woman’s face except for the eyes. It generally flows down till the mid back to cover a woman’s hair and may flow down to a woman’s mid-chest in the front. Although the majority of scholars agree that hijab is mandatory, only a minority of them says that the Niqab is. Most of the people get confused in niqah and hijab and use them interchangeably and incorrectly. A niqah cover the face except for the eyes, however a burqa conceals the entire body of a woman from head to toe. Burqa is regarded as the most concealing of the Islamic veils. Abaya is a loose maxi dress designed thoughtfully to cater to the needs of a Muslim woman. It’s a cultural and religious symbol as it covers the body of woman, but apart from that an abaya is also regarded as a fashion statement followed not just by Muslim women but by women across all western countries. Muslim women basically look for clothes that above all express her simplicity. So, Muslim women clothing is modestly crafted so that the women can have a higher degree of covering. 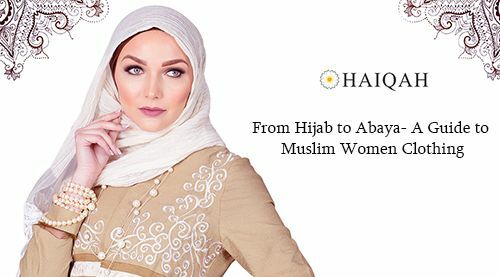 At Haiqah, our goal is to offer an extensive line of modest clothing for women, without having to sacrifice on style.